I hope that you weren't blown away over the weekend, I was lucky enough to get completely saturated twice on Saturday! Just a few reminders for this very special and important week. Parent Letters - these are due today. Please make sure they are clearly labelled with your child's name. If you have not already given it to me, can you please make sure that it is handed in tomorrow morning at the absolute latest. Confirmation Retreat - please make sure that your name is down next a plate. All food can be taken to the canteen on Wednesday morning. There are still a few empty spaces left...if you can't make it into class please email Alisa or myself and we can make a note for you. This a free dress day - please make sure your child is warm and comfortable. Confirmation Ceremony Rehearsals - these will be on Wednesday afternoon at 1.30pm, we will be attending Reconciliation on Thursday morning at 10.30am and then another rehearsal on Friday afternoon at 1.30pm. Just a couple of reminders for the candidates and prayer buddies as we continue our preparations to celebrate the Sacrament on Saturday 5th August. Bishop's Visit - On Monday 31st August Bishop Gerard Holohan will be coming to meet all of the students and spend some time discussing their preparations. 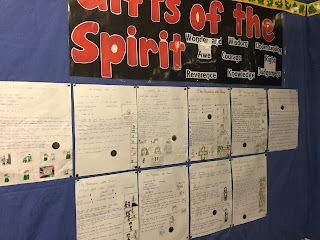 We have been learning a lot about the Fruits and Gifts given by the Holy Spirit, we have looked at the Nine Beatitudes and discussed how they can show these within their own lives as well as writing a procedure on the Rite of Confirmation. During his visit he will be asking all the students (not just candidates) a wide variety of questions about the Sacrament and their preparations. If you can spend some time reviewing these concepts over the coming days with your child that would be great! This will help them to feel confident with any questions! Sashes - Those students that are having their sash done by Hip Pocket will receive it back on Thursday 3rd August. To celebrate the end of our Friendology 101 sessions we would like to have a shared morning tea on Friday 11th August beginning at 10am. If all girls could please bring in a small plate of food to share that would be wonderful! Please be mindful that refrigeration space is limited. Please see below for an example of how the Confirmation Card needs to be completed. Please make sure that mum's fill in their maiden name and include the date of Confirmation as 5th August 2017. 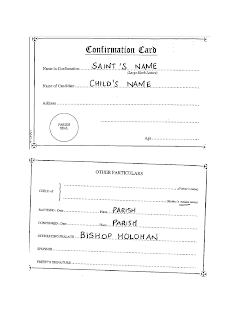 These need to be filled in and returned to me by Monday 31st July along with the list of completed Sacraments and $25. If you need another copy, please let me know. A very big thank you to those parents and students that attended our Commitment Mass on Saturday. I was very proud of the students and the attitude they demonstrated towards the mass. I would also like to thank all the parents that came along to our Confirmation Parent Workshop - I hope that you enjoyed it as much as I did!! Confirmation Parent Letters - Please make sure that you are working on these. They are due in on Monday 31st July and will be given out at our retreat on Wednesday. Please make sure they are clearly labelled with your child's name. Confirmation Retreat - Alisa Allison has kindly volunteered to coordinate morning tea and lunch on this day. She will be in touch with you all shortly to coordinate your contributions. In the coming weeks we will need to be having some rehearsals before school. Please check below if you are needed and on what day. These are the before school rehearsal times for next week. If you travel to school by bus in the morning, that is okay. If you can please get to the hall as soon as you can. You can include pictures of the following either separately or on the page for that year – for example pictures of your Year 5 camp might appear on your Year 5 page or you can do a separate one for Camps. ·Camps ·Sport Days – Swimming/Athletics/Cross Country/Interschool etc. ·Musical ·Friends/Signatures ·Awards ·Confirmation ·Graduation ·Any other pages that you might think of you can include. Include any photos, embellishments, award cards, special pieces of art that you may have created that year. You do not need to spend a lot of money printing photos or buying lots of materials – you can decorate your page through drawing as well. Welcome back for the term! I hope that you enjoyed the break. I sent an email last week outlining some important information about Confirmation, please take the time to have a read. 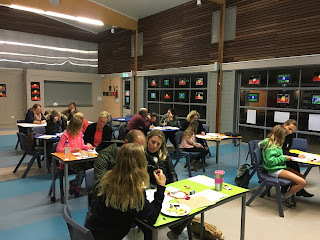 I will see all candidates and their parents at our Workshop on Thursday night beginning at 5.30pm in the Hall - prayer buddies are not expected to attend on Thursday night. All students and their families are expected to attend the Confirmation Commitment Mass on Saturday 22nd July beginning at 6pm. Family Camp - I will be sending home forms for Family Camp to the Year 6 families this as you are being given priority in attending. If you are interested in attending this year, you will need to have your forms returned to the office by Friday 28th July. Please see below for the Homework assigned for this week. Reading - 10-15 minutes written in their diary and signed.